Living on the Fast Lane? Love racing? well this just might be the game for you! 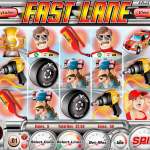 Rival developed this game for all you racing fans giving you a chance to race and win some very nice cash prizes. You have it all here: nice jackpot, expanding wild, free spins and a bonus round. There are two scatters in this game. 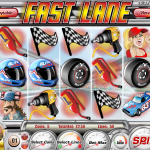 The Blue Blitz Cola race car is the Free Spins symbol. landing 3, 4 or 5 of those will get you 5, 10 and 20 free spins while all of your wins will have a 3x multiplier. The Chequered Flag is the other scatter. Landing 3 or more will give you a free ticket to the Bonus Round. You will have to perform some maintenance work in the pit-stop. Successfully doing so will win you cash prizes instantly! This is the interactive bonus game and it’s triggered by landing three or more of the chequered flag symbols anywhere on the reels. You’ll see a short movie as the green car pulls into the pits and then you must follow the crew chiefs instructions as quickly as possible to perform the maintenance. The Jackpot symbol is the FX Red Car symbol and landing 2, 3, 4 or 5 will win you 8, 88, 888 and 8888 respectively!! 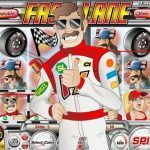 Fast Lane should appeal to all of you loving race cars and looking for an engaging game. The RTP is not the highest we’ve seen at 93.2% but it is still a lot of fun. All together we would sum this game by saying it’s like a good driving day. Do you like being a master of your own luck? Try playing Fantasy Fortune a 5 reel slot by Rival.